Before noon, on a blistering summer weekday, Manimal Smokehouse co-owner Jeff Kang is seven hours deep into smoking cured hunks of beef and pork into juicy goodness. The scent of burning oak travels all the way down the steep metal staircase leading up to this four-man barbecue project, a 30-seat restaurant located in Itaewon that was almost a year in-the-making. 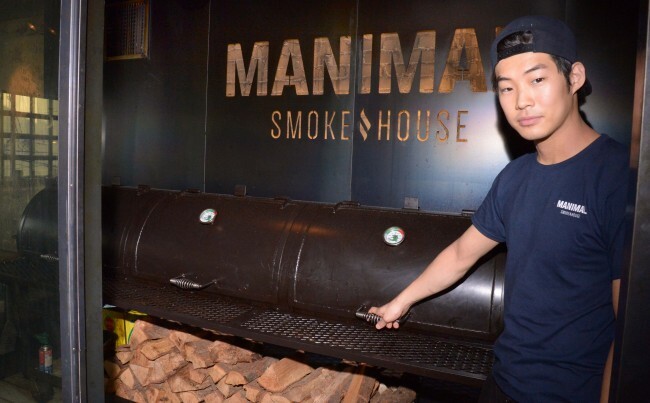 Manimal opened its doors near Noksapyeong Station this April and ever since then Kang has been busy barbecuing from around 11 p.m. to 2 p.m. day-in and day-out. “It’s a lot more work but the pay-off is totally worth it,” Kang, 34, said of using a wood-fired smoker. To achieve that much-sought-after combination of smoky bark, succulent center and full meaty flavor, Kang has to clock in an average 15 hours on his custom-made offset smoker. “I have to tend to the wood every 20 minutes, add wood, rotate the meat and spritz the meat to keep it moist,” Kang explained, pausing to toss some more logs in or pull out hunks of meat to let them rest before business begins for the day. Despite the long and hard hours, Kang insists on using a wood-fired smoker, eschewing its electric-powered cousins in the belief that one cannot get “the smoke flavor infused into the meat” the same way. Then, after all the meat has been pulled out of the smoker and allowed to rest, it is ready to be served, though not for long, because even on a weekday night, brisket can sell out as early as 7 p.m.
Brisket, one of Manimal’s strong suits, arrives in thick slices, with an outer crust of dark chocolate-hued bark, that telltale near-ruby smoke ring and an impossibly velvety center. Each slice veritably melts away, soft and juicy, no extra sauce or fixings needed. Pulled pork is served up in a silken heap, a tangle of rich almost buttery meat, to be scooped up, glistening, succulent forkful by forkful and washed down with one of the Hand and Malt Brewing Company’s domestically-brewed craft beers on draft. Then there is the chicken, which arrives, slightly charred and crisp, slightly sweet and smoky, a solid addition to the pork- and beef-centric menu. “Everybody loves chicken,” Kang said. Other barbecue includes housemade Andouille sausage and pork ribs. On Fridays and Saturdays, Manimal also serves beef rib. “We only make three a day,” Kang revealed. Given that it takes all day to barbecue meat and there is only one smoker, Kang recommends customers who want to try all of Manimal’s barbecue come in when the restaurant opens, at 5:30 p.m. from Tuesdays and Thursdays and at noon on Fridays through Sundays. As it nears opening hours, Kang starts to pull out the meat from the smoker so that it can rest. Kang recommends resting large hunks of meat for at least an hour, stressing that this helps the meat absorb moisture. For those who are barbecuing at home, he recommends resting the meat in an ice-free, ice box. Kang also is serious about prepping the meat, sprinkling it with sea salt and pepper and curing it overnight in the refrigerator. While smoking, Kang makes sure to spray his meat with apple cider vinegar which he says “helps tenderize the meat.” When he wants his meat to caramelize on the outside, he adds cola to the mix. Considering Kang honed his skills with a “cheap smoker” for around two years before he turned barbecuing into a serious profession, perhaps the most important tip to be gleaned from Kang comes from his own experience; that mastering the craft is a long-term investment. In Kang’s eyes, all those years and all those hours still being spent rendering meat into succulent, smoky tastiness is worth it. 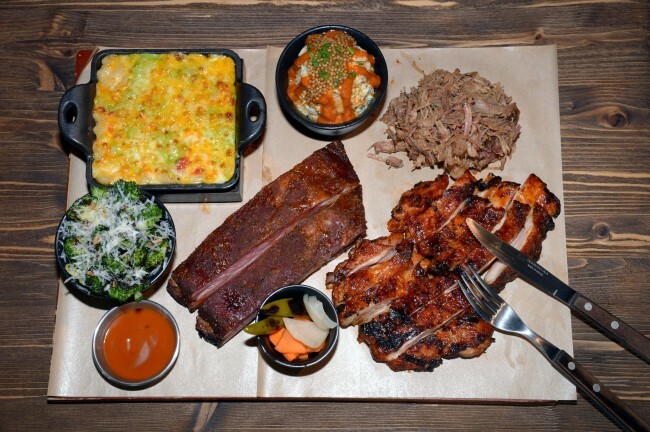 “You can’t go wrong with just a good-tasting meat,” he said.